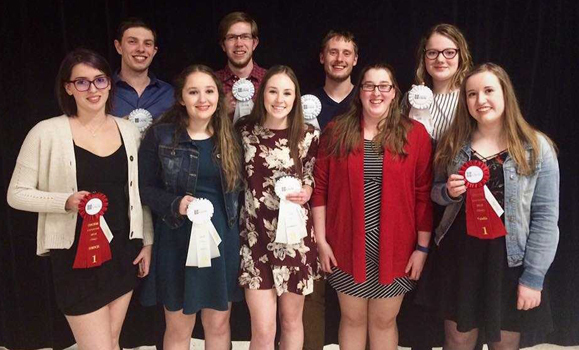 Nine students from the Dalhousie Faculty of Agriculture Judging Team recently travelled to Quebec City to compete at Université Laval’s Judging Competition as a part of their 43rd Week of Agriculture, Food and Consumer Studies. The team faced competitors from Université Laval, McGill University and Guelph University during the competition. The event consisted of livestock and crop categories with livestock classes of: Beef EPD’s, Dairy cows, Egg ID, Poultry, Swine, Wool and a livestock quiz. The crops portion included: Automotive Fluid ID, Hedging/Commodity Markets, Maple Syrup, Potatoes, Seeds, TMR and a crops quiz. The competition proved to be a valuable experience for everyone to improve their judging skills, including for five members new to the team this year. Several individual judges from Dal placed in the top three for a variety of classes and both Dalhousie teams placed in the top three for several team categories. Thank you to Université Laval for hosting this competition, and congratulations to the Dal AC Judging Team on succeeding and representing Atlantic Canada’s aggies so well!